The company has to adapt to a radically different environment: there are changes in production functions, distribution channels, customers, markets and human resources. It is necessary to modify the ways businesses are managed and led. The governance of the company must formulate a vision and a strategy for change and ensure a framework for flexible and transparent action that facilitates the alignment of the entire organization. The goal is twofold: to promote a continuous process of open innovation and respond to the demand for social values, best practices, respect for the environment and sustainability. 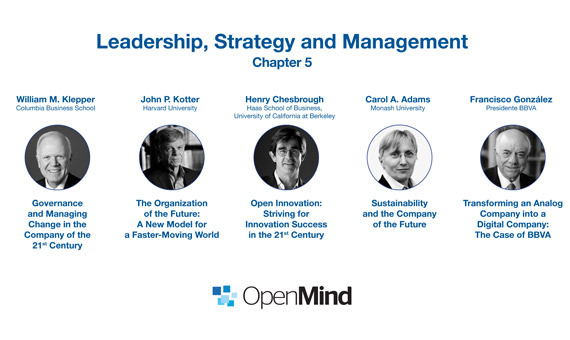 In this chapter of the book Reinventing the Company in the Digital Age, Francisco González, John P. Kotter, William Klepper, Carol A. Adams and Henry Chesbrough analyze the keys of the transformation process of the companies to adapt to a new world.